Cast steel : carbon cast steel, alloy cast steel, stainless steel etc. 70% in Europe and America; 25% in Japan; 5% in other areas. 1. 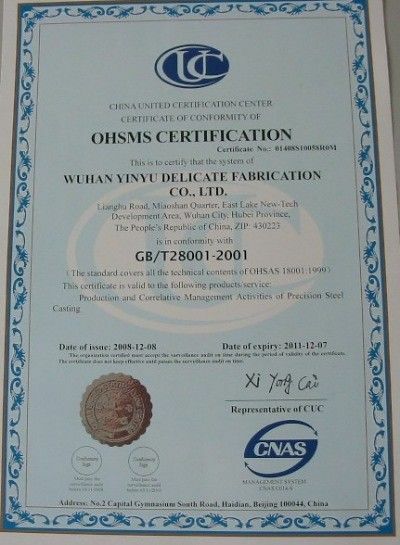 We can rely on your quality? A:1) Incoming Inspection,There is a formal procedure for incoming inspection;All purchased items come to a central location that is clearly marked as "Incoming Area". The formal procedure for inspecting parts includes methodology of inspection on the line. A formal procedure for control of records exists and is being implemented. 2. Can you guaramtee the delivery time? A:We enjoy a good reputation of timely delivery amomg our customers,products can be delivered according to your requirement strictly. Can you handle my unusual alloy requirements? 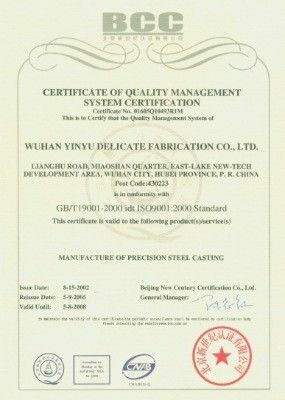 Yinyu Precision can cast all stainless steels, and a variety of other materials. We can also use special alloys made to your specifications. In addition, certified chemical and physical analysis are furnished when necessary, as well as NDT. Do you have the capabilities for large and/or small production? We have the flexibility to handle both large and small production runs. SIMIS Precision Casting prides itself in meeting your specific requirements and deadlines. What are the benefits of Investment Casting? Investment Casting provides you with incredible design flexibility and reduced costs. 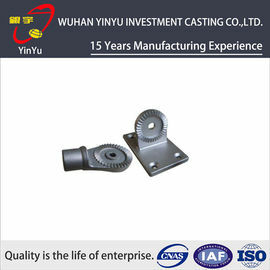 What are Yinyu Precision Casting's part size capabilities? Yinyu Precision Casting specializes in both large and small castings - from intricate, miniature parts that are 1/10 of an ounce or less to large investment castings of up to 50 pounds. 6, Long history got professional technicians and craft.